A free game client, unlockable packs, weekly challenges, and the most recent cards available make Magic Duels the last, best Magic: the Gathering video game you’ll ever need. 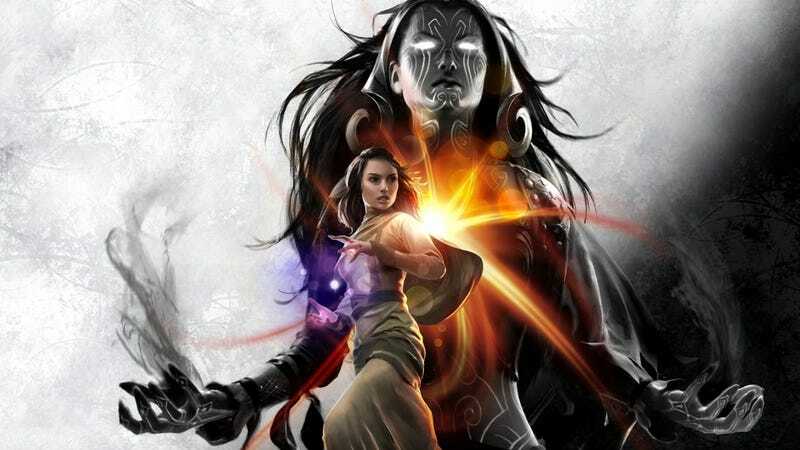 The Magic video game, originally called Duels of the Planeswalkers, has gone through several annual iterations. Players have gradually gained more control over the cards they play with and the decks they use. Last year’s edition featured full open-ended deck building, but it also featured cards you could only acquire by paying extra, even after you’d paid for the game itself. No one was terribly happy about this—in my review I used phrases like “garbage decision” and “a damn shame.” To their credit, Wizards of the Coast got the hint very quickly. Just a few months later they released an expansion that made all the cards in the game available without having to pay for them. That backstory is relevant because this year’s edition of the game is an effort to fully repair the harm that was done to the game’s reputation. And I have to say they’ve done a hell of a job. To begin, the game has now been renamed Magic Duels. There won’t be new versions every year—this is what they’re calling a “persistent client.” This will always be the base version of the game. New cards, and presumably new features, will be added over time through expansions. But the core game will stay the same. It’s also 100% free. Wizards has also worked closely with the game’s developers so that the most current new Magic sets are used in the game. This first release of Magic Duels includes cards from the Magic Origins set that technically doesn’t come out until this weekend. This is a big improvement over prior editions that used cards from sets that were a year old. This will hold true for future expansions as well. What’s really excellent is the way you go bout unlocking new cards. Instead of unlocking a single card at a time or preset packs by beating certain opponents, you earn coins. You can get coins by playing against the computer, against online opponents, or by completing challenges (like winning five games with a green/blue deck, or countering five spells). You then use these coins to purchase six-card packs of random cards that are added to your collection. It works a lot like the Madden Ultimate Team mode on recent EA Sports games, while the rotating challenges are highly reminiscent of Hearthstone. No complaints there—learn from what works! You can, of course, purchase coins with real money if you don’t have the patience to grind wins for more cards. But every single card in the game is available for free just by earning the coins through play. The persistent client means they can add elements over time, like the ability to spend coins on background or virtual card sleeves. Currently, it costs 150 coins for a pack of six cards, and five coins to make a card in your collection “foil.” Playing through one Planeswalker’s story mode will give you enough coins for a pack, while it will take 10 wins against the hardest AI opponents to earn your 150. Beating online opponents gets you 20 coins. Gameplay is still pretty much the same; they mastered this several iterations ago and haven’t messed with what works. I will say that playing on an iPad, I had a very difficult time with targeting. When you cast a spell, it floats out onto the battlefield when the game asks you to pick a target. Unfortunately, the spell you cast overlaps large portions of the other cards on the battlefield, making it very difficult to select the one you want to target. I’ve also accidentally killed my own creatures with spells several times because the targeting is so wonky. It would be nice if there was an area set aside where spells “on the stack” would sit, out of the way, until choices are made and they resolve. Quite a few Magic fans will be happy that the Two-Headed Giant mode has returned. This was never a format I liked, but I know a lot of fans were as upset about its absence as the premium cards last year, so it’s nice that its back for those who enjoy it. There’s one other thing Magic Duels does extraordinarily well—the tutorial. I’ve never seen a better tool for teaching new players how to play Magic. When you first start the game, it takes you through a few basic games that explore some of Magic’s basic mechanics. Periodically, the game you’re playing will be set aside and you’ll be presented with a “skill challenge” that allows you to demonstrate mastery over a concept like blocking in combat or casting instants. It works perfectly. In fact, I hope someday they expand on it to explain more advanced rules and strategies (“Combat Tricks After Blockers Are Assigned,” or “How Protection Works” for instance). You can, of course, play against online opponents, where you’ll run into all kinds of decks. Single-player mode lets you play through the origin stories of five iconic Planeswalkers (with CGI cut-scenes that are at times unintentionally hilarious), or you can play against random AI decks. The AI seems to have improved this year. It can be hard to put together a decent deck with your first five or six packs, so you’ll end up grinding out games against the AI until you get some better cards, but I actually see that as a positive. It’s a long journey to collect every card you might want, giving you plenty of reasons to keep playing. I’m pretty damned happy with this version of the game. It captures a lot of what is fun about these Magic video games, and I can’t wait to see what they do with it over time. Magic Duels is currently available for iPad and iPhone, and will soon appear on Steam, Xbox One, and PS4.